I thought I would pick up my old Magnor setting, it would work much better under the guise of the M&M system. And I'll start with the Map, I ahve been working on for quite some time actually. More information will follow given time. Last edited by JoshuaDunlow on Tue Nov 05, 2013 2:38 pm, edited 4 times in total. Once again I have to say that's a beautiful map you created JD. The various nation names truly sound evocative. They certainly piqued my interest. HustlerOne wrote: Once again I have to say that's a beautiful map you created JD. The various nation names truly sound evocative. They certainly piqued my interest. I'll have more for you in the near future. As the setting will be more "super heroes" in the past, over my other which was more D&D'ish. So high-powered fantasy similar to Exalted? Yes thats a great analogy. So , here's the low down. The World / Realms of Magnor is a High Fantasy Medieval Setting. The setting includes such races as elves, dwarves, and humans, and then includes much more powerful races. Such as demons, elves, and angels. Many of the realms you see listed now, are ones I have at least done a little detail about, In my old 2E threads.The design of the world, is meant to cover a lot of different styles, found on just one continent (at least for now). Character creation is even more upscale, granting starting players 20 pp's per PL to create their characters. And usually start at Power Level 8. There are many origins possible in this setting. Mutation. Often caused by some supernatural source, such as magic, or pre-turnatural, or the effects of chaotic/demonic energies. Race/Species. There are many races and species upon the realms, which can be a source for some innate racial abilities. Such as elves, dwarves, and much much more. Esoteric. The study of the Mind, ie Psionics, breeds the term Mystic in the realms. While those who study Magic, breeds the term Arcane. There is also Divine sources of magic, since the gods are very prominent in a setting such as this. Empowerment. Often the most common, is magical, alchemical, and technological. though the technology is often more magical in nature. Ultra-terrestrials. This is the term for those not native to realms, who live, in alternate dimensions or realms. And often supplants the alien Origin. Training/Pargons. The paragon is a term for those who reach legendary proportions, but are still in the realms of what might be considered the limits of their race or species. Legendary heroes fall into this category (Half Gods fall into this category somtimes). There are so many gods amongst the realms, it sometimes is very hard to categorize them all. Though in Magnor, they are all lumped together, and refered to as a collective group of "patrons". Though I will try and give a list of some of the more popular religions in time. The human kingdoms are made up of.. Lanae, Nymrea, Illis, Endii, Magnakai, and Harakhane. 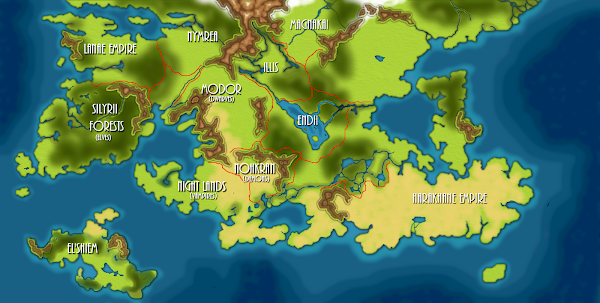 The Dwaven kingdoms are made up of a single mountains region, called Modor. While the vampires call the Night lands there home, and demons live on the outer region of them against the Mountains region of Nohkran. The Angels come from a region in the far north, not shown on the map, called Celestis. This is my campaign setting thus far, which I will expand upon. Humans are the most prominent species in the world, but not by much there are almost as many non-human races in the world of Magnor as there are humans. So when your walking down the street, you can usually see 1 non-human to every 3 humans. As a species they are also the most varied, and dynamic. And can live in almost any environment you could imagine. We will only be show casing the major human races at the moment; Which are composed of the Magnakai, the Nymrean, the Illistaern, the Endii, and the Harakhane. But the world has more than just these particular cultures, these are however the most popular. All humans can live anywhere from 70 to 100 years of age. Truly enduring ones can live up to 130 years of age. The Endii are a great people, somewhere between the levels of Magnakai and Nymrean technology. But many know them as a decadent people, who enjoy living their lives to the fullest. Many El`Shiem Elves, make home in this idillic country. Which surrounds an incredibly large lake. The Endii culture is almost feudal, barely held together by the Monarchy. Many nobility, such as Barons, Counts, and dukes vie for power. Backstabbing and Politicking are common. The men of Endii are very boisterous and forward, while the females learn the more subtler arts of intrigue. Endii are fair skinned individuals, and considered quite attractive. Their mixing with the El`shiema elves, somtimes results in half breeds. The Harakhane Empire is one of the largest and spans much of the great deserts, and contests with Magnakai for pure size and influence. The empire is ruled by a god queen or king, that has either been chosen by the current ruling religious philosophy at the time or through Hereditary Lineage. They are a proud people. They are a dark skinned people, who often have earth colored eyes, such as green, brown and black. Patrons of Worship: The Harakhane worship their king or queen, and the great primal energies. Sun, Moon, and Earth. The Illistaern are a mysterious and dying people, that live in the ruins of what used to be a great empire. They are incredibly pale, and its rumored their archives hold untold arcane lore which has been lost through out the ages. Their eyes are just as pale, sometimes an icy blue, or magenta color. Many Illistaern become mages or priests, since their sickly appearance does not work well for Military action. Their eyes are an eerie magenta color that glows dimly in the light. The Magnakai often include the lands if Illis within their borders, the Illis do little to disrupt this belief as long as it doesn't interrupt their own life. Deep inside their archives and crypts, one might find , hidden magical lore. Patrons of Worship: The Illistaern worship gods of magic. The lane is a fierce empire which is only held at bay, by their neighbors, the silyrrii elves and the nymreans. Who they share alliances with, at least for now. They have fair skins, and dark hair tones. The Lanae practise slavery within their borders, which more than often comes from their own lower ranks. But sometimes, one might find a dwarf amongs them. For some reason the Lanae, have a deep distrust for them. The Magnakai are the embodiment of Western European society, mimicked in most fantasy games. But with an incredible level of magical technology, making them the dominant power in Magnor. The trade with just about every race and culture, giving them a strong economic base. Their army also uses Golems, and Air ships. They have tanned skin colors, bright eyes, and a broad spectrum of hair colors. The Nymreans are a mixed society, that is open to many cultures and ideologies. They are also perhaps the oldest race to exist. It’s said that the pure Nymreans held great power once upon a time. Nymreans set the average standard for your Western Medievalism. They are divided into two groups however, the Pure blooded Nymreans are a long lived race, are very proud, and still hold onto the greatness of their past. While the Mixed blooded Nymreans are more open as stated above. Nymreans tend to ahve a pinkish hue to their skin, which is much more prominent among their true blooded. Oddly enough it is the true blooded, which usually holds positions of power in their society. The great Nymrean libraries, hold some of the oldest collection of historical articles around the continent. Keep up the good work Joshua Dunlow. Thanks I'll have some non-human goodness up soon. I shall anticipate further developments then! The Elshiema Elves unlike any other elven species, is a very decadent and sensate race. They value the accumulation of wealth and pleasure above all else, this does not mean they are against hard work. Quite the contrary, but living life pleasurably always requires a little sacrifice. So even the pursuit of pleasure is worked into every part of daily life, and living it to the fullest. The El`shiema live upon an great island full of vast and lust beauty, intermixed with grand marbled architecture. The island itself lies off the coast of Silyrii. Physically they appear much like any other elf race, They can have a variety of hair colors, but it is usually anywhere from white, silver, gold, or black. And eyes are almost always a rich gemstone color, such as sapphire, ruby, emerald, etc.. These eyes glow imperceptible during the day showing their innately magical nature. Being so far away from other species, they have no natural enemies save those pirates or slavers who attempt to raid their coastal cities for wealth and slaves. Native Language: Silyrii and Elshiema. All El`shiema speak Silyrii fluently with a slight dialect to their tones. But they have developed their own language , which combines subtle body movements and nuances , which can often be confused as a form of dance or a simple gesture. Silyrii Elves, children of the stars, are the highest and the most noblest of their race, they live in a forested region on the southern part of the continent and west of the vast dwarven mining fields. They live in one of the last great forests of that area, before it breaks upon the south-east shores of Magnakai. Their cities have an almost ethereal glow to them, since they use so much of the mystical metal which is taken from their own name. Silyrii , the star metal. They can have a variety of hair colors, but it is usually anywhere from white, silver, gold, or black. And eyes are almost always a deep blue, which glows imperceptible during the day showing their innately magical nature. The Silyrii elves have been fighting a war with the vampires of the night lands for many centuries, because of their innate ability to resist the powers of the vampires. These vampires live in a volcanic region just to the south east of the Silyrii borders, which then breaks into the Night Lands and Nokhran. The land of Silyrii also has the largest deposits of the famous star-metal, making them important allies with the humans and dwarves. Most Silyrii elves practice divine magic , for obvious reasons. Perhaps the most vicious and intelligent of the so called Undead, are the Vampires of the Night Lands. A volcanic region to the south, that almost never see’s the light of day. Many vampires have a sickly gray skin tone, that almost has the texture of stone. Especially the older they get. Unlike vampires from other worlds, these vampires are not killed by sunlight. Many vampires pick up hit and run tactics, that take advantage of brute force and their ability to drain the Intelligence of their victims. They are considered strong as stone, agile and swift, charming, and with a deadly sharp wit. Their appearance is always Intimidating to say the least. The body of a vampire is extremely durable and tough, their flesh almost becomes as hard and cold as they stone they are buried in. Though they are weak against water, which makes their flesh slough away from their bones. The soul of the vampire is extremely tied to their physical form, its the only thing still giving them animation. And if the vampire does not take care of themselves, they will start looking like nothing more than rotting caracases or skeletons. Earthly living concerns are unknown to them. As a vampire drains a victims blood, they are afflicted by a powerful disease , which steals a victims intelligence. This in turn leads to the familiar mind thrall they can place on others. When the victim looses their the final amount of their mental energy, they too can be brought back as one of the undead. Through the use of Necromantic Magic, they are able to drain the life force of others by touch, healing their own damage in the process. The more powerful and older they are, the more unique abilities they possess. The atypical secondary power, is the ability to grow leathery wings from their bodies. The Mountain chain of Nohkran is a terrible place, because not only do Demons dwell there but the descendants of a race of demon hybrids, that have existed on this world for thousands of years as well. They lie upon one of the greatest mountains chains, north of the night lands where the Vampires dwell. Nohkran do not like undead any more than, the other races. Their leeching craft, is an abomination even to them. Seeing them as soul-less creatures, tainted by disease. Making this region one of the most dangerous in Magnor. The Nohkran like many demons, come in a wide variety just like humans. They do not require possessing a human form to live in the material plane. The forests are scorched, the sky a hazy orange color. The mountains upon which they live, vast and foreboding. Vast forges which lie underneath these great mountains, mold the screams and torture of souls into a Infernally twisted metal, called Soul forged Steel. A burnished metal, that swims with the echoed torment of the souls that where spent creating it. The dwarves of Modor, sit between a vast field of mountains on either side of them. To the west there are the elves, and to the east are the humans of Endii. Within this vast stretch of plains, are vast fissures and valleys from which the dwarves have been delving for centuries. Accumulating a large variety of wealth, which makes them a power though Magnor. To the south are the demons and vampires , whom they are the first defense against. So a great wall was built to attempt to shut them out. Most dwarves stand 4 to 5' tall. With tan to dark skin, from years of exposure to heat and the earth. Their eyes are like glittering gem stones, though colors tend to be vibrant and strange. From orange, to citrine, coal, and amber. They are broadly built, who often pride themselves on growing intriciately decorated beards. There is also another breed of dwarves, called gnomes, who are roughly a foot shorter. They are often bald, and do not care as much about how full and long their beards are. And generally have a more evil bent to their desires. Both races however have a thirst for treasure and accumulating wealth. Making them shrewd business men. But where gnomes show little care for keeping their word, Modor Dwarves would never. Keep up the jolly good work JD! Now I'm sitting down and giving expanded racial notes about each race. And decided I'm gonna see how I can make each race unique and different in their own right. The Endii are a great people, somewhere between the levels of Magnakai and Nymrean technology. But many know them as a decadent people, who enjoy living their lives to the fullest. Many El'Shiema Elves, make home in this idyllic country. Which surrounds an incredibly large lake. The Endii culture is almost feudal, barely held together by the Monarchy. Many nobility, such as Barons, Counts, and dukes vie for power. Backstabbing and Politicking are common. The men of Endii are very boisterous and forward, while the females learn the more subtler arts of intrigue. As a people, they descended from a very peaceful nature loving people. But over time and exposure to others, they found themselves being taken advantage of. So they decided to never be taken fool of again. Complexion: Fair, Pale, Sun kissed. Often considered quite attractive among others. Hair & Eye Color: Hair color tends to be earthy, dark blondes and browns are more common. Eye color almost has them predominantly Magenta in hue. Though blue is not unknown. Maturity & Life Span: The Endii reach maturity by the time they are 14. And can live up to 90 years. Patrons of Worship: The Endii share many patron religions with the El'Shiema. Among those that they venerate: Sharay, goddess of pleasure & delight. Gaelen, god of thieves and mischief. Navinye, goddess of the Night and Treachery. Abilities (4pp): The Endii are a cunning and persuasive people. +1 Awareness, +1 Presence. Advantages (2pp): The Endii's fair skin and shapely forms make them attractive, and the know how to use that to their advantage. Captivating a persons attention. Attractive 1, Fascinate. Skills (2pp): Most Endii know how to detect and use deception to their benefit. Insight 2 & Deception 2. Feature: Glib Secrets. The Endii are natural manipulators, understanding the nuances of the social game. Gaining them +2 bonus to Innuendo attempts for Insight & Deception. Some Endii still share some of the strength of their Ancestors, some might have the some El'Shiema blood running through them. So player characters may take some of these traits as powers. Side Stepping. The Ancient Endii used to be able to disappear into their surroundings when they desired. It has three levels of power. Minor, Major, Greater. At its “Minor” level this is the Hide in Plain Sight advantage. At its “Major” level, the Endii can gain a partial concealment (visual, passive) effect. At its “Greater” level, it grants the Movement (Permeate) effect. These Effects are accumulative.